We’ve got robots, suits of armor and a drunken space cop in our Triple Shot this week. Over at Marvel NOW! the Brits give Wolverine a makeover. That is, they blast his flesh off of the bone and make over his body once or twice in the first few pages of Woverine #1 by Paul Cornell and Alan Davis. Hellboy and B.P.R.D stories are usually dropped in time rich after WWII and Hellboy’s origin. This particular story is right in the middle of the war, in 1944 with grunts, cigarettes, nets over the helmets and classic call backs to the classic comics of Joe Kubert or Joe Simon. 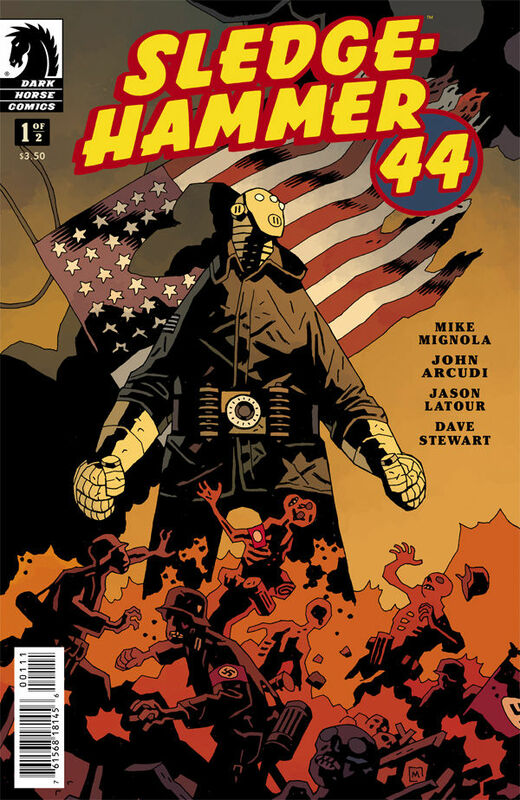 This two parter expands the Hellboy-verse to include a man in a suit of armor charging at a Nazi foothold in France after being dropped in the shell of a Blockbuster bomb onto the battlefield. The U.S. soldiers on the ground are given strict orders to be backup for the behemoth Project Epimetheus aka Sledgehammer 44. Nazi soldiers are no match for the super-powered suit, but the Germans counter with an enormous S.S. robot that crashes it’s way out of the enemy armory it is protecting. The Lost in Space looking armored enemy gets the upperhand on the Allied weapon and our boys retreat, dragging the mysterious knocked out Sledgehammer back to base camp. Will the Nazi’s catch up to finish off old Sledgy? Jason Latour gives us great pages of classic looking comic art on this war story. The design of our new hero is all Mignola, but the storytelling is textbook Kubert School and all details wonderfully rendered in a classic illustrative line. The book was intended for the late John Severin to draw and collaborate on with Mignola and Arcudi. The Marvel artist passed away in 2012, and rather than shelve the script, the book was released and dedicated to the master penciller with reverence to his memory. My only complaint is that this book is only two issues! We hope to see more of our WWII ‘Ironed Man’ in the future. 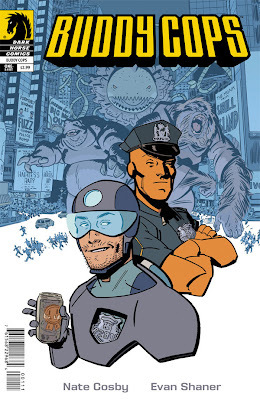 From the pages of Dark Horse Presents is the story you haven’t been asking for in Buddy Cops #1. Reprinting the material from the anthology series with some bonus material for good measure is the story of two cops—well, not exactly. This is the story of a partnership between T.A.Z.E.R. and Uranus. You see, Uranus is an intergalactic space cop, you know the type; a guardian or part of a corp. Uranus caught drinking on the job and was demoted to lowly duties, earthbound as it were as a regular beat walking stick swinging cop. They let him keep his space sword and jetpack, though. It gets wacky when a janitor reboots a 1970s uptight traffic enforcement cop android called Tactical Android Zoned for Efficient Resolution, (T.A.Z.E.R.). Stick these two in a cruiser and see what happens! I identify most with Uranus, who screams out Wu-Tang lyrics on the scene of the crime. Old T.A.Z.E.R. is just a fuddy duddy automaton with no game, but on the plus side has a detachable head that more than once comes in handy in combat. The ‘tension rises in the third act’ as the partnership is blown apart by Uranus getting married and then impregnated by a member of the plant-like Fregnar race. Uranus’ daughter tries to eat all of the people in the city and the team is back together again as T.A.Z.E.R. forgives and forgets. This is such a funny book and it’s great to see ‘Doc’ Shaner work on a full story after following his sketch blog (http://www.evanshaner.com) for the past couple of years. Nate Cosby has a new all ages book book Cow Boy (http://cowboycomic.net/about) with letterer and artist Chris Eliopoulos that we’re dying to check out soon! This book ain’t nuttin to F$% wit’. I’m in. Well, I’m most of the way in with Marvel NOW! Not all books appeal to me but what would be the fun in that anyway? By not rebooting the 616, but updating the titles and characters to be more aligned with the movie universes is just fine with me. I’ve not been a huge X-Men fan since the ‘90s, but hey—now I’m reading two team X-Men books. 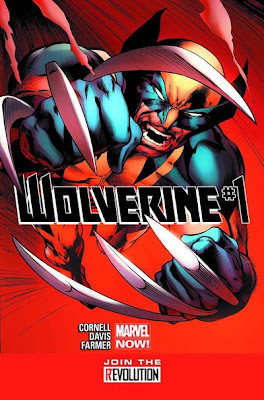 The excitement I have for the mutant plight as analogue for oppression and sticking it to the man has never been higher, and now with so much happening with Bendis’ teams, it’s good to also attach myself to my favorite Bub, Wolverine. Sure, Logan’s all grown up now and an Avenger somehow (look, I’m behind the times, OK?) but this new Wolverine title is exactly what I need and is almost reminiscent of the Larry Hama run on the book. Let’s have Wolverine go off and have solo missions like the good old days! Marvel and DC ‘time’ obviously allows for these guys to be in four or five different books seemingly at the same time (sorry, the kid in me still thinks about that stuff) but that’s where the fun comes in. It seems that Paul Cornell and Alan Davis have Logan becoming a detective for a few issues before returning him to a team or running into any other heroes. This book can exist on it’s own already and we’re only on issue #1. Older fans of Wolverine have a great start here to jump on board, as no current continuity is referenced (besides the aforementioned Avengers bits). Who is this kid that wants to take his father’s ray gun and watch Iron Insides regenerate over and over again? Looks like Logan is tracking his scent in the next issue, and I can tell you I’m on board. This is the kind of art that made X-Men and Excalibur comics must reads from the spinner rack coupled with equally masterful storytelling by Paul Cornell. This is top of the stack stuff, for sure.